You’re a writer and you don’t blog? Get with it! Read on to find out why you really, really should have a blog. Writing for a blog every week is like going to the gym…it flexes your writing muscles. Once you get into the routine of working, you’ll find you want to do it more and more. Blog posts are usually shorter than that 100,000 word novel you’re working on (if they’re not, you’re in trouble), so they have the added benefit of helping to focus your mind on the important stuff. Remember the Dark Ages before the Internet, when you were as likely to bump into someone useful you didn’t know and tell them about your work as you were to travel to the moon? Those days are no more. Once you get a blog you’ll make friends and contacts with people you would have no other way of meeting. People who read blogs are highly likely to be connected to Facebook, Twitter and other social media. Each of these media open up a whole new world of connections and interactions: it’s a welcome snowball effect. If you’ve already got fans/followers who are following your progress think how much easier it will be to pitch your idea to an agent or publisher. If you can offer them a ready-made audience/consumers, then your submission will look all the more attractive. Think of your blog as your shop window…it’s a reflection of who you are and what you’re about, your values and aspirations. Nowadays it isn’t enough just to be a good writer with an eye for character and a feel for plot. You’ve got to be able to market yourself. A blog is a free and relatively painless way to get yourself out there. Maybe you’re just not that techy or maybe the idea of your own website to fill is daunting. A blog is a perfect solution to this. Generally speaking, they’re easy to set up and maintain, come with ready-made social media sharing buttons and are free. You can add pages just like a website too. What’s not to like? Blogs are personal. They’re a reflection and record of your writing journey, so naturally they end up being a comfortable place where you can unload and process your thoughts, then step back and reflect on where you’ve been with your writing and where you’re headed. The “comments” facility on blogs allows your readers to leave feedback. This is a vital part of the writing process and can really steer you in the right direction with your writing. Again, if you can say to an agent or publisher that you’ve had feedback and have acted on it, you’ve got a much stronger pitch to offer them. They don’t have to be serious. And even if they are, chances are that once you get started you’ll find the whole process addictive. Checking out your stats, responding to comments and thinking up the next blog post will become your latest hobby. Go on, you know you want to! Take the case of Christian Lander. His humorous blog Stuff White People Like became something of a viral success story, gently sending up the values held dear to the average white liberal American. But Lander had the last laugh. Random House offered him a rumoured $300,000 for a book based on his blog (Whiter Shades of Pale). And he’s not alone. Just think, next time, it could be you! Blog as a character from your writing. Your progress as a writer: the highs and lows and everything in-between. Is your writing set in history? Why not go through a period in history day-by-day and blog about events that took place back then? Blog about your favorite writers/books and what they mean to you. Try a flash fiction blog by writing a short piece of fiction for each post and see what feedback you get. In an inspirational blog you can post a photo, quote or challenge each time to inspire others to write. Blog about writing competitions. You’ll be providing a useful service and meeting up with other aspiring writers. Dedicate your blog to a genre of writing you love, whether it’s romance, sci-fi, history or crime. A magazine-style blog including interviews with other writers, short news items and longer features. A “nuts and bolts” blog offering tips to other writers on how to find work, arrange your schedule and even organize your finances! Lucy Radley is a freelance writer and researcher living in London. She has been working in the industry for over five years and has had the opportunity to work with many leading brands during this time. As readers, we’ve been at this new phase of electronic reading now for going on two years, with regular readers now in the play instead of only early adaptors. This new trend of traditional publishing pricing is setting the price bar pretty firmly above $5.00 general level. – There was (for a time) downward pressure on prices in electronic books in 2010-2011, but this trend has pretty well faded and now reversed (except at the high levels of pricing, meaning books above $15.99 still find a ton of resistance). A very vocal group of indie booksellers are keeping the pricing lower for some indie publishers. They confuse “sales” and “discounting” with original Suggested Retail Pricing. — All this is for what I call “normal readers.” A reader who would ONLY buy a book from a discount bin or cheaply at a used bookstore will disagree, of course, and love the 99 cent novel trend. But normal readers, the masses that are now starting to enter the electronic reading world are fine with paying a fair price. And if the price is reasonable, won’t even notice the price for the most part. These ebook prices are slightly different than my earlier suggestions. And for ease of stating, I am using word count as markers. This is not always the case. Word count in some genres, such as young adult and early readers or fat fantasy, can vary. So these are only guidelines. Those are my pricing suggestions here in early 2012 for ebooks. I think they would have been slightly off a year ago, slightly too high for the market back then. But now, as electronic reading goes into this new phase, out of the early adaptor phase, I think the above pricing is fair and following trends in publishing in general. You must decide what kind of publisher you want to be. Remember, my opinions are based on my desire to be a long-term publisher, selling in all markets all over the world. Short term gains are nice, but not something I would spend much time chasing. We shall see how these prices work over the next few years. I might be doing another pricing update a year from now. But I don’t think so. 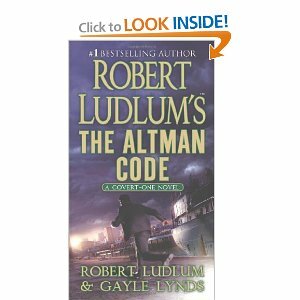 Dr Ernst Cadman has led a quiet life, but that’s how he’s wanted it all these hundreds of years. With a secret like his, anonymity and caution are the best friends a man can have. Nothing could tempt him from the safety of his parasitic existence at the heart of the city of Sarum—at least nothing this side of the Abyss. Cadman stakes everything on obtaining the artefact that once destroyed an entire civilization, but in so doing he draws the gaze of a sinister presence from beyond the stars. Meanwhile, Deacon Shader, veteran of the war against the undead armies of the Liche Lord, has one last fight in him. This time it’s just a tournament, with the prize a sword steeped in myth. Win or lose, Shader intends to defy his Templum master and retire to the Abbey of Pardes. When a horror from the past wrecks Shader’s monastic dream and leads him to plague torn Sarum, he finds an ancient power unleashed that imperils more than he could possibly imagine—a power now in the hands of Dr Cadman. Gods tremble, and worlds will fall unless Shader can conquer his personal demons and accept the fate he’s been prepared for since birth. "Cadman's Gambit" is the first book of the six part SHADER series by D.P. Prior. An excerpt of Book 2, "Best Laid Plans", is at the end of the Kindle version of this book. There are also excerpts from three other great fantasy books. The Kindle version also includes the stunning cover art of Mike Nash, two beautifully rendered maps, and a clickable table of contents. D.P. Prior has a background in theatre, music, theology, psychiatry, and physical training. 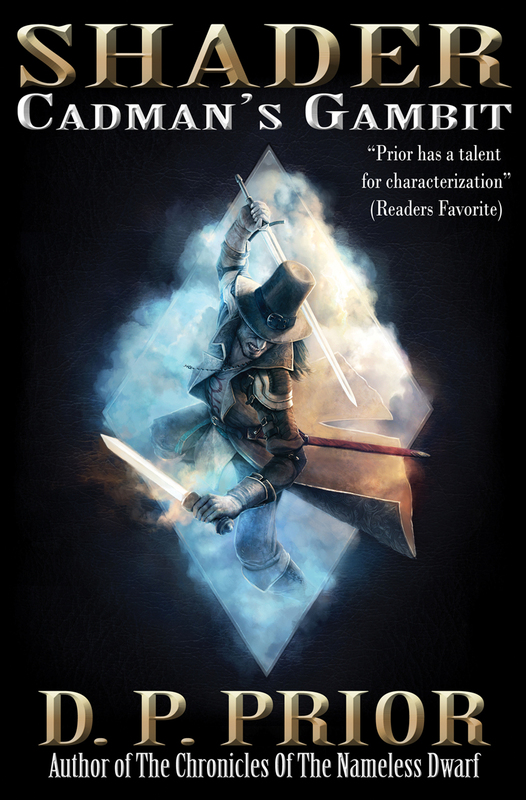 He is the author of the SHADER series of fantasy books, the first of which, "Cadman's Gambit" is now available in paperback and ebook formats. Other works by D.P. Prior include: "The Ant-Man of Malfen", and "Thanatos Rising". 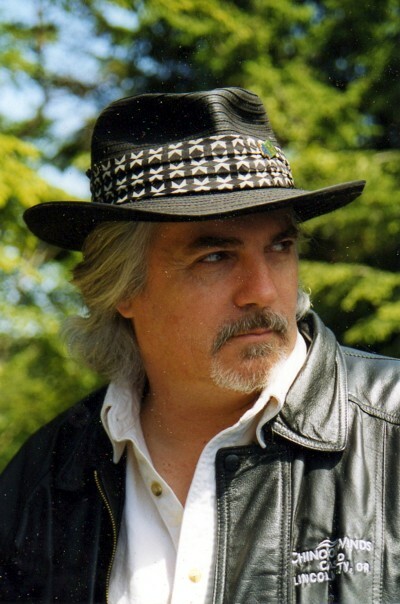 His main writing influences are Edgar Rice-Burroughs, David Gemmell, Stephen Donaldson, Mary Doria Russell, Robert E. Howard, and Michael Moorcock. His work is also infused with his passion for mystical theology, philosophy and a childhood love of Dungeons and Dragons. Dr. Alexandra Langley is a woman trying to get out from under the shadow of her famous archeologist father, Franklin. It seems no matter what she does in the field, his name looms large. When an opportunity comes up to look for lost Mayan artifacts in the jungle of Guatemala, she jumps at the chance to lead her own expedition. She runs her group with an iron hand. She must not show any weakness or vulnerabilities, that is, until photo-journalist Mitch Hasslet joins her team. Mitch has his own demons to overcome from a past war assignment. When he accepts the assignment from the enigmatic Museum Director, Mr. Nicholson, to track a stolen shipment of Mayan artifacts, he has no idea that he would be joining Alex's team. Sparks fly between Mitch and Alex and not always in a good way. Ms. Miller does a good job of revealing the back-stories for both of the main characters while weaving an intense and engaging storyline. Searching for Mayan artifacts in the jungle has its own perils especially when the team stumbles into an area known as "No Man's Land." The jungle comes alive with vivid descriptions, almost too vivid. It made me realize that I never want to visit there--the humidity, the mosquitoes and the screeching night sounds are definitely not for me, but it’s a sign of excellent writing when you're so immersed in a story that you start to feel itchy right along with the characters. 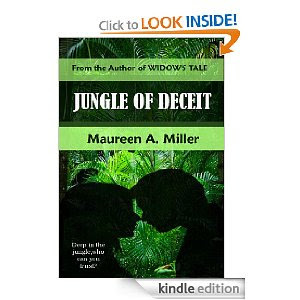 Jungle fires, lies, deception and a fight for their lives make JUNGLE OF DECEIT a romantic suspense story at its best. This is the second story I've read by Ms. Miller and I have no problem recommending her books highly to fans who want more than a typical romance story. The symbol system of the Tarot can elicit curiosity, wonder, fear, intrigue, superstition, etc. Attitudes about these images range from reverence to hatred. Sometimes referred to as the Devil’s Picturebook, one common opinion is that the images carry esoteric knowledge, forbidden or suppressed information, or hidden history. There have always been those who consider playing cards sinful, devilish, and evil, tempting the users with immoral behavior, and beliefs that Tarot games also impart heretical philosophies. Other names for the Tarot were the Bible of the Gypsies, the Encyclopedia of the Dead, and the Perpetual Almanac - names that imply information. What is written about the history of these cards varies, and it is generally agreed that ancient roots, if any, are speculative. Are there ancient roots? If so, are they forgotten? Or just ignored? If we believe “out of sight, out of mind,” then perhaps forgotten is correct. To explore this we can start with the history of playing cards. There are a few theories as to where gaming cards came from, and when they were introduced to European culture. One theory is that the “evil objects” came by way of the gypsies. Another unlikely theory is that they were brought to Europe by crusaders; neither timeline works. Literary evidence does suggest that “domino cards” existed in China before 1000 A D, and another early Chinese type called “money cards” (so named because the suit signs are coins). Both are teaching cards also used for games. 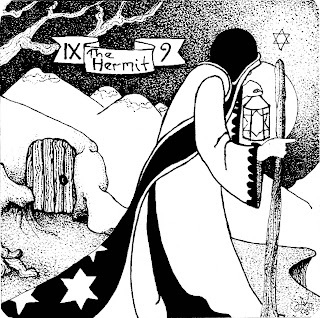 When looking at the history of the Tarot, The Book of Thoth, ca 3000 BC, is mentioned as a source; historian Duncan-Enzmann contends that this esoteric tome derives from megalith navigators working at Lixus, Nabata, and Byblos, ca 4200 BC – with knowledge dating back to 6000 BC during warm Atlantic centuries. The symbolism on cards has a long history, and an interesting role in terms of information. Modern flash cards cover a great variety of subjects. These teaching tools are designed for everyone from prodigy infants to struggling adults, all sorted and categorized into subject matter. There are computer programs designed to simulate this very effective learning method. One could compare teaching cards of today with the inscriptions and images that accompany oral traditions from antiquity. Most people associate cards with games. Cards were first mentioned as a game in Europe in the 1370’s. A card game called Tarocchi, said to have begun as a parlor game, had illustrations of court nobles on them. The most likely prototype of the imagery on the Tarot trump cards would be on medieval teaching cards, used as visual aids for memorization. Teachers used this system of colorful symbols when illiteracy made books impractical. These cards depicted Saints, biblical and mythological characters, personifications of sins and virtues, the seven disciplines of knowledge, the seven known planets, and the signs of the zodiac. They enabled transfer of information easily using visual symbolism, even to those who could not read. Tarot cards have a special place in symbolic language. There are stories of the Tarot cards being carried by troubadours during the Middle Ages; many believe these cards carried secrets, or hidden knowledge that was protected from the Roman Catholic Church by preserving it in a series of symbolic images. Many of the images are of the sun, moon, and stars. Many more also have astronomical significance, perhaps not as readily recognizable. One example is the major arcane card Strength. Imaged correctly as a female and a lion, this card carries the same information as the Sphinx: that of the Great Year at Equinox. Another symbol that is part of many cards is the “infinity” symbol, representing the Analemma (a symbol relating to the position of the sun and the equation of time), which appears above the female’s head on Strength, above the magician’s head on The Magician, and also, in the Two of Pentacles, which decodes as a solar, lunar, and stellar year. Astronomy, both as an exact science, and an art, encompasses a wealth of information. Transmitting mathematical precision and interesting descriptions of the multitude of fascinating events demands accurate recording. How was this done, then, before written records? Even with words we have a hard time maintaining accuracy and consistency; images are critical for this type of information. Let us consider how astronomy was taught Once Upon a Time, long, long before written records. In these long ago classrooms most teachers were women and most students were girls. Lessons were likely recited, rhymes chanted and sung. Over centuries, imagine how these songs would be elaborated, celebrated. Visual aids were used: pictures, symbols, numberings, signs, patterns. All on stone, bone, ivory, ceramics, bast (bark), etc. – small, and easily re-ordered, like flash-cards. Or playing cards. For thousands of years these lessons were taught, handed down with oral tradition using stories, songs, and pictures. The Grand Stories of the Zodiac were taught, pictures created, and astronomy developed. The ancient mariners of ca 4000 BC had skilled navigators called Gorgons. These women were masters of astronomy, wind, and current. Knowing time to the second is necessary on the high seas – the Ace of Pentacles symbolizes the ability to do this using the Venus Clock (used to set Earth’s clocks until the 1970’s). The association of wealth to pentacles is logical, considering that being able to calculate time and location with Venus allowed trade and defense – both necessary for successful commerce. Over thousands of years megalithic observatories were constructed; a great continental utility built to support women and children, facilitating agriculture and navigation (today we have air traffic control, marine rules, and electric production – all to support human life). The construction of these observatories required that measurement be transmitted over great distances with accuracy, and also a method of teaching how to measure the heavens and divide circles. We can see some of these lessons in the symbolism of the Tarot. The suit of wands or scepters represents ashera poles, a tool the ancients used to measure movement of the heavens and survey the ground for construction of an observatory. The Three of Wands represents the Triple Tau, or Triple Pillar, a symbol of measurement of a star’s height from the horizon. The Five of Wands depicts dividing an angle by five. Perhaps the card with the most ancient roots is the Two of Swords, a depiction of a solar azimuth V – an image found in Blombos, S. Africa, dating to 77,000 BC. This is all well and good you might be saying. But what of divination and the power of the cards? There is power there, the power archetypal imagery has to reach our thinking, our subconscious, our genetic memories. The images used on the Tarot are representations of situations, animate and inanimate, common to humankind, recurring over millennia. An example would be the Wheel of Fortune communicates to us about universal life cycles, connecting them to something greater than the human realm. It depicts elements of astrology and the zodiac, symbolizing the natural cycles which affect all life. Cards can be arranged in almost infinite configurations, creating a vast variety of associations between archetypes. These patterns create significant triggers in our brains, enabling us to think in otherwise dormant ways about a situation. Yogi Barra said “prediction is very difficult, especially about the future.” This does not devalue any method of looking at possible futures, something the archetypes on the Tarot are a very good catalyst for. Over time knowledge can be lost, hidden, suppressed, and destroyed. All of these things are constant challenges in the process of preserving and passing on knowledge to succeeding generations. The same fate befalls the artifacts on which knowledge is recorded; there are Tarot images that have faded into dust. Historian cryptographer Duncan-Enzmann postures that there are at least twelve lost Major Arcana images. These would complete the set of images now called the Tarot, which depict environmental conditions as a function of time, the geometry of dividing circles, and situational cycles of life. Symbols are powerful. They move us. They compel us. They come from the very biology of which we are made. It is no surprise then, that this ancient visual language engages our imaginations, provokes fear, or feeds superstitions. But, like any other form of communication, it only has the power with which we infuse it. I found a great site, KINDLE FANTASY AUTHORS, through twitter. They are doing a combination spotlight feature and an interview with me. The spotlight is on ASSASSIN'S CURSE. First published in Writer's Digest, by Simon Wood. For a good suspense story to work, what’s at stake must be stated at the beginning of the story. Think of Ian Fleming’s James Bond novels. At the beginning of each story, the reader knows who 007 is up against and what deadly plan he has to stop. While a mystery writer plays his cards close to his chest, giving little away to tease the reader, Fleming plays his cards open for all to see. In doing so, he—and any suspense writer—takes a risk. By establishing what’s at stake early, some of the story’s sense of drama can be easily lost because the reader knows important details, such as who, why and when. This is what makes suspense writing a challenge. Playing with an open hand, the suspense writer must create tension by inserting a strong protagonist and developing inventive story developments that avert a certain outcome. 1. Give the reader a lofty viewpoint. The reader should have foresight. Let the reader see the viewpoints of both the protagonist and the antagonist. By giving the reader a ringside seat to the story’s developments, she gets to see the trouble before the protagonist does. The reader sees the lines of convergence between the protagonist and antagonist and feels the consequences of the perils ahead. Also, this technique allows the writer to place emotional weight on the reader. The tension will build from the reader’s self-imposed fears of knowing that the hero is on a collision course with disaster. 2. Use time constraints. Another key way to build suspense is through the use of time. The protagonist should be working against the clock, and the clock should be working for the bad guys. In Robert Ludlum and Gayle Lynds’ The Altman Code, Covert One agent Jon Smith has only days to prove the Chinese are sending chemical weapon materials to Iraq. In Greg Iles’ 24 Hours, Will and Karen Jennings have one day to escape their captors to rescue their child from a kidnapper. Every minute you shortchange the protagonist is another notch up on the burner under the reader’s seat. 3. Keep the stakes high. This doesn’t necessarily mean the story’s hook has to be about global annihilation. But the story must be about a crisis that’s devastating to the protagonist’s world, and the hero must be willing to do anything to prevent it from occurring. Therefore, the story could be about a father trying to rescue his wife and child from an impending flood, or an innocent man who’s framed for murder going on the run to establish his innocence. The crisis has to be important to ensure readers will empathize with the protagonist. 4. Apply pressure. The protagonist should be working under what seems to be insurmountable odds. All his skills and strengths must be stretched to the breaking point in order to save the day. The hero should bend, but never buckle under the pressure the antagonist applies. There should be only one person left feeling helpless in the story, and that’s the reader. 5. Create dilemmas. Suspense loves a dilemma. The antagonist needs to be throwing things at the protagonist that present awkward challenges or choices that will test her caliber. The choice must seemingly be a lose-lose situation for the protagonist. This may take the form of choosing to save one person while leaving another to die, picking up a gun after swearing an oath never to do so again or taking that offered drink after years of sobriety. 6. Complicate matters. Pile on the problems. Give the protagonist more things to do than he can handle. The hero has to be stretched wafer-thin. If you’ve ever seen one of those old music-hall acts where spinning plates are perched on top of flimsy bamboo poles, and there’s some poor guy running himself ragged trying to keep all the plates from crashing down, well, that’s how it should be for the protagonist. The hero should be that guy trying to keep all those plates spinning, while the antagonist is forever adding another plate to the line. By the end of the book, the protagonist should be just barely preventing everything from crashing to the ground. forward for the protagonist. The hero shouldn’t be able to rely on anything going right for her, and any step forward should come at a price. The antagonist shouldn’t go unscathed, either. In Newtonian physics, for every action there’s an equal and opposite reaction. The sheer presence of the protagonist is going to gum up the antagonist’s plans, which means the antagonist is going to have to improvise. Both players will have to be quick-witted to deal with any and all upsets, especially as the story progresses toward its climax. Remember, the protagonist and antagonist don’t have to be the only monkey wrench in each other’s lives. Let outside forces be that, too. These characters might be locked in a do-or-die battle, but the rest of the world isn’t. Friends, neighbors, deliverymen and even public holidays can all be flies in the ointment. And don’t forget Mother Nature herself. 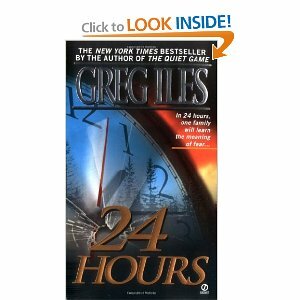 A great illustration of this is the opening of Robert Crais’ Demolition Angel, where two bomb disposal experts are trying to defuse a bomb—and an earthquake occurs. Brilliant! Essentially, keep that storyline fluid. The reader might know what the story’s end game is, but this doesn’t mean they should know how it’s going to get there. 8. Create a really good villain. In a mystery, the villain has to be somewhat transparent because you don’t want the reader to catch on to who she is too quickly. But in a suspense novel, the bad guy is very visible. A great villain isn’t someone who twirls a handlebar moustache and ties damsels to railway tracks. The ultimate antagonists are smart and motivated. They have to be to have created this spectacular hook that’s going to keep readers riveted to their La-Z-Boys for the length of a book. Flesh this person out. Explore the antagonist’s motivations and character. Give the reader reasons why the antagonist is who he is. The reader has to believe in and fear this person. The villain has to be a worthy opponent to our hero. Anything else won’t do. 9. Create a really good hero. If the book has a great bad guy, then it’s going to need a great hero. This may be key to any story, but the suspense hero has to be someone the reader believes in and cares about. When the hero is in peril, the writer needs for the reader to hope that person will pull through. Shiny gold aviator wings. Black wings. What do these two things have in common? 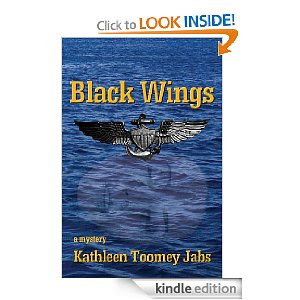 That is what Lt. Bridget Donovan sets out to discover when she learns her former roommate at the Academy, Audrey Richards, is killed when her F/A 18 Hornet fighter plane failed to gain altitude during a night launch and plunged into the sea. On the surface it appears to be an accident, but when Bridget visits Audrey's mother to pay her respects, she's in for a nasty surprise. Mrs. Richards hands Bridget a pair of black wings she found in Audrey's flight pants and a photo depicting a Wall of Shame. Mrs. Richards wants answers, not pat Navy speak. Bridget has no idea what she is getting into when she agrees to investigate the photo's origin. Ms. Jabs tells this riveting story in two timelines, present day and during the women's Academy's years. We are given a glimpse of what it's like to be a woman in the Navy--the regulations, the hardships, constantly trying to prove that they are as good as the men. Not many make it through plebe summer, but when Audrey takes Bridget under her wings, Bridget improves her performance and a fledging friendship is formed. The writing in this story is sharp and intelligent. The author clearly has first-hand knowledge of the Navy and it shows. The character of Bridget is tenacious in her pursuit of the truth about Audrey's death. The reader feels her sorrow, her regrets, and her outrage at what she sees as a cover-up of the accident. The pages fly by quickly--back and forth between the timelines--until everything in this military mystery is revealed. In the end, no matter how you view these two women, there is no doubt that it's good to have an advocate like Lt. Bridget Donovan on your side. Highly Recommended. Why doesn't President's Day honor Abraham Lincoln? Abraham Lincoln may be the greatest of all US presidents. He ended slavery, won the Civil War, and ensured that the United States would remain united in the modern world. His face is printed on the five-dollar bill and stamped on the penny. The Lincoln Memorial is one of the nation’s iconic sites. But Lincoln’s Birthday on Feb. 12 is not a national holiday, and it never has been. Nor is Lincoln officially remembered on a federal President’s Day in late February. That’s just not the case, despite a widespread belief to the contrary. True, people have tried to make Lincoln’s birthday a US day of commemoration. One of the first was Julius Francis, a shopkeeper from Buffalo, N.Y. Beginning in 1874, he made the public remembrance of the 16th president his life’s mission, according to a 2003 Buffalo News article on the subject. He petitioned both Albany and Washington. New York went along and made Feb. 12 a state holiday. Washington and Congress did not. Remember that for decades following the Civil War the South and North remained split as to how to remember its sacrifice and heroes. Days to remember the fallen arose on separate dates in the two regions. In was only with the nationalizing tragedy of World War I that these combined into the Memorial Day we now celebrate. Thus, a national Lincoln holiday would have been controversial to many in the South until well into the 20th century. Perhaps that’s why Congress as a whole remained resistant. That didn’t stop states, of course, and many state governments followed New York’s lead in establishing Lincoln’s birthday as a holiday. 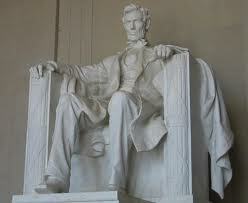 On Feb. 13, 2012, state offices in Illinois will be closed to honor the Great Emancipator. But in recent years, some states have ditched Old Abe, in part because it falls near the federal holidays of Washington’s birthday and Martin Luther King Jr. Day. In 2009, the California legislature passed a bill ending Lincoln’s birthday as a paid state holiday. This bill called for the legal public holiday known as “Washington’s Birthday” to be known by that name and no other. But it also requested that the president “issue a proclamation each year recognizing the anniversary of the birth of President Abraham Lincoln and calling upon the people of the United States to observe such anniversary with appropriate ceremonies and activities.” This legislation was assigned to the House Committee on Government Reform, and there it languished, unpassed. Thus, 203 years after his birth in humble circumstances in rural Kentucky, Abe Lincoln still doesn’t have a federal day to call his own. This is a very short novella, a mere moment in time. 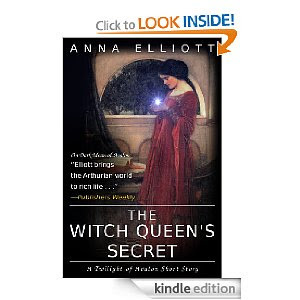 It takes place between the first and second book in the Twilight of Avalon series. It is the story of Dera, an army whore who finds herself being offered shelter by Queen Isolde at Dinas Emrys if she would agree to help out with caring for the wounded. Dera has a 2-year-old son to care for and having a dry place to sleep and food to eat is the best she could hope for, and she readily agrees to the arrangement. When a wounded man bursts into the workroom spouting off about traitors against King Madoc, Dera volunteers to go and warn the king on the battlefield that he must return to Dinas Emrys before it is overrun by the traitor Marche. Not knowing any of the backstory, this tale would have been more enjoyable if I knew the story between Isolde and Dera more intimately. That being said, there wasn't much character development and I found the choppy sentences distracting. I am not a fan of this type of writing and I don't think I'll be buying any of the other books in the series. The book description sounded intriguing so I took a chance on this free novella. Unfortunately, I was disappointed. How much is too much #Marketing? Being an indie author has both perks and a downside. The best part is having complete control over your books, where you publish them and how often you publish them. Amazon now has the Kindle Lending Library that gives authors 5 free days every 3 months to pulse their books free. There are so many things that I love about being an indie author, it's hard to list them all. But, there is a definite downside and that is, the marketing piece. As an indie author, you are responsible for getting the word out about your books. It's good strategy to have a blog, Facebook account, and a Twitter account. There's also Google+, Triberr and Pinterest. I have an account at Google+, but honestly, I haven't done much with that. I have no interest in joining Pinterest. This week I joined Triberr to see if I could expand my blog readership. You join a tribe and it's kind of a "pay it forward" place. Your blog posts import into your tribal stream and the other members tweet it for you. My responsibility is to check the tribal stream for other tribal member's posts and decide whether or not to re-tweet them based on whether it would be of interest to my twitter followers. All this social media activity definitely cuts into my writing time. It's a constant struggle to get the word out about my books and still have time to write new stories. Some days I only have time for social media. The blog takes up most of my time. I try to blog about subjects that will keep my readers coming back day after day. So, how do you handle everything? Do you have a dedicated time put aside each day for writing and one for your social media activities?